Match ends, Liverpool 1, Manchester United 2. 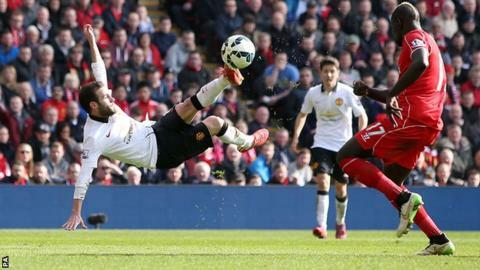 Second Half ends, Liverpool 1, Manchester United 2. Substitution, Manchester United. Marcos Rojo replaces Daley Blind. Substitution, Manchester United. Falcao replaces Ander Herrera. Goal! Liverpool 1, Manchester United 2. Daniel Sturridge (Liverpool) right footed shot from a difficult angle on the right to the bottom right corner. Mario Balotelli (Liverpool) is shown the yellow card for a bad foul. Substitution, Liverpool. Mario Balotelli replaces Alberto Moreno.